In this commissioned artwork you will find three major themes; the story of “The Little Prince”, the myth of Atlas, and the tenets of Buddhism. That was all the input I was given, and all the input I needed. 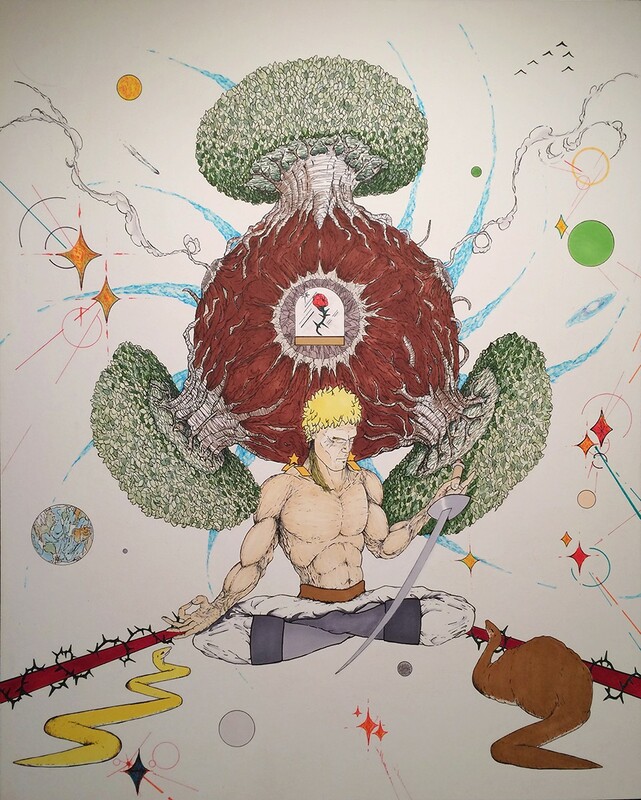 Within the composition you will find the central character of “The Little Prince” seated in a contemplative Buddhist pose while sustaining the Titan’s archetype. Elements of the book are found throughout the piece; the 6 asteroids as well as Earth, the Rose he befriends on this home asteroid along with the 3 volcanoes, the baobab trees, and the two snakes, each very important to story in their own regard. The flight of birds that carried him to Earth can be seen in the upper right section of the artwork. His contemplative disposition rides along the Buddhist theme of the work, each of his hands form a Mundra symbolizing internal vibrations or intentions. With his right hand he holds the “Vitarka”, a symbol of intellectual discourse and teaching; the circle formed by the thumb and forefinger represent the infinite cycle of wisdom. In his left hand he holds his sword and the Mundra Karana, symbolizing defensive action towards “demons” or other such negativity which must be dutifully warded off day to day in our reality. Overall, the contemplative warrior and responsible being, holding his own world upon his shoulders all the while passing on knowledge and defending against negativity.